This foresight activity was conducted as part of the EU FP7 SESTI project (Scanning for Emerging Science and Technology Issues) aimed at developing a process that can be used to identify weak signals and emerging issues in a systematic, efficient and effective way. It also pursued the application and implementation of such techniques by contextualizing them and initiating discussions within the policy arena, thus linking them in a meaningful way to existing policy processes. To enhance the quality of the comparison of the different weak signal scanning approaches, the content domain was limited to signals that are precursors to changes in the research and innovation system. This policy brief reports on the approach and findings of the SESTI project on the health theme. Countries have been facing increasing pressure on health service budgets due to a number of factors. This trend is projected to accelerate over the coming years, and countries are desperately looking for ways of limiting expenditure without reducing the quality of services or their accessibility. Demographic and societal change. The ageing population has profound implications for the cost of health and social services. Health informatics and telemedicine. ICT is changing the face of healthcare. ICT systems are revolutionising information sharing between health professionals, for example through the development of seamless electronic patient records. This requires the implementation, maintenance and upgrading of a sophisticated infrastructure with all the investment that this entails. New health technologies. New pharmaceuticals and techniques are continually being developed leading to a broader range of treatments applied on a routine basis resulting in additional medical costs. But new health technologies can also contribute to decreasing costs, at least in the mid to long run. Better early diagnostics (enabling cures at an early stage), self-monitoring of health functions, robotic assistance (enabling the elderly to live on their own for a longer time or assisting medical and nursing personnel) and modern prosthetics (enabling disabled people to work more efficiently) can improve efficiency and reduce costs over time (Braun et al 2009, p 22). 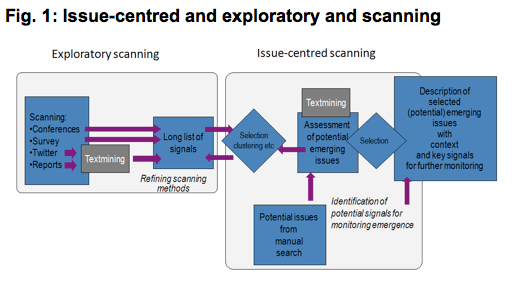 During the project, two different approaches to identify new emerging issues were followed: issue-centred scanning and exploratory scanning. In this approach, the project team foresight experts systematically conducted searches for signals that could indicate potential emerging issues. The scan tapped various digital sources, such as scientific journals, newspapers, policy papers, reports and statistical data books. This approach provides valuable information and is a very useful technique for identifying emerging issues but has the drawback that it may miss the so-called unknown unknowns, although individual scanners may stumble upon them during the scanning activity. The first focused on selecting potential emerging issues that may be relevant to the topic being researched, using material from the national horizon scanning exercises. The second is based on a more open search on the Internet, using key questions and phrases as search strings constructed by the experts based on the kind of issues one may expect in the subject area. The method delivered a useful set of emerging issues that were used as input for the workshops held later during the project. In the exploratory approach, the foresight experts examined a variety of digital sources of information and screened them for weak signals using automated text-mining tools. The advantage of this approach is that it does not rely on an expert for identifying topics and that it should be more effective in identifying novel issues outside the perception of policymakers and expert communities. While the concept of a bottom-up approach using automated techniques appears attractive, in practice we found that the difficulty of clustering the raw data posed an obstacle to successfully identifying emerging issues. Thus, the further development of the text mining tools would be necessary before this technique could be applied reliably in practice. The scanning exercise produced a long set of early warning signals. This list was then refined through an assessment exercise where the underlying issues as well as the impact and uncertainty of the signals were considered. There was also a first appraisal of the reliability of the signals. The signals were clustered in different ways, taking into consideration the content dimension (keywords, areas and topics) as well as significance and granularity. Visualisation tools, such as tag clouds, were employed to help identify keywords and provide a basis for discussion. Keywords may be either single words or phrases (e.g., health care, regenerative medicine). Selection of significant emerging issues. Following the conclusion of the scanning and processing phases by the SESTI team, a workshop was held to present and discuss the project results with a variety of stakeholders, including national policymakers, thematic experts, EC officials and delegates from the private sector. A workshop paper was prepared and circulated to the workshop participants beforehand as background material for the meetings. Voting on the issues by the participants on four criteria: impact, plausibility, novelty and policy implications. The scanning exercise identified a number of emerging issues of which the following five were highlighted as being the most prominent. A wide range of new offerings beyond conventional medicine and outside the public health system have sprung up in recent years. Diminishing trust in conventional medicine, the debate on cultural diversity in medicine and the increasing use of complementary and alternative medicine may lead to new requirements with regard to regulation. This field encompasses a number of therapies including herbalism, meditation, acupuncture, yoga, hypnosis, biofeedback and traditional Chinese medicine. A growing number of people in Europe (more than 100 million) are turning to complementary and alternative medicine for disorders they feel cannot be treated with conventional therapy. Advances in medicine means that humans are living longer than ever before. However, for the individual this may prove to be a mixed blessing since the quality of life of the elderly is often compromised due to frailty, reduced mobility, dependence on medication, financial limitations and loneliness in the twilight years. One in four older adults lives with depression, anxiety or other significant mental health disorders. In many EU member states the suicide rate among the elderly is higher than that for any other age group. This aspect of the ageing population has been overshadowed by the economic perspective related to the pension problem and rising healthcare bill. The psychosocial consequences of an ageing society and the related problems are not widely known. It is estimated that in excess of one billion adults are overweight, and that at least 300 million of them are clinically obese. Obesity has reached epidemic proportions and has been a major contributor to the global burden of chronic disease and disability. Within Europe, obesity affects 20-30% of adults, and a cause of particular concern is the increase in obesity rates among the young. Rising obesity is the result of a combination of factors – increasing affluence leading to abundance of food, poor consumption habits due to a hectic routine, and a sedentary lifestyle. To combat obesity we need to recognise and address these realities, yet a number of endeavours aimed at raising public awareness and encouraging a healthier lifestyle appear to have had a limited effect. The problem calls for a new impetus and for a broader approach in the fight against obesity. Most medical research funding is channelled into ways of treating disorders rather then towards methods of preventing disease. Whilst nobody would contest the remarkable progress and medical discoveries that have been made in recent years, new pharmaceuticals and treatments have contributed to a spiralling healthcare bill. Rising citizen expectations and an ageing society have placed further demands on healthcare services, and most countries are facing major challenges in terms of its sustainability. The time may be ripe for radically rethinking health research strategy. Social interventions at policy level have a high impact on health and may become of great interest to public health policy. Nevertheless, the outcome cannot be measured in the same way that the outcome of clinical trials or health behaviour interventions on individuals can be measured. Personalised medicine is an approach that tailors interventions to individual variations in risk and treatment response. Although medicine has long made efforts to achieve this goal, recent advances and falling costs in genomics are beginning to make this concept a reality. Pharmacogenomics may also provide an opportunity for an increased range of medicines. A number of drugs fail to obtain regulatory approval because they have a negative side effect on a small part of the population. This reduces the range of available medicines and pushes up the costs of research. If the genetic element could be incorporated into the testing and licensing procedure, it would be possible to develop many more drugs provided that these would be prescribed on the basis of successful genetic tests only. As the cost of genetic testing continues to fall, it may be generally available as early as 2014. The recent developments raise questions about regulatory policy, technology assessment, and especially the financing and organisation of medical innovation. The workshop proved invaluable in bringing together a variety of perspectives representing different interests, including academia, the public sector, the private sector and civil society. This collective knowledge ensured an interesting and balanced discussion and helped impart a certain degree of validity and legitimacy to the results. The workshop conclusions are summarised below according to the issues introduced above. The growing popularity of complementary and alternative medicine could lead to a demand for a diverse mix of medical services in the future. The regulation of practitioners may need to be extended to include those practicing alternative medicine. This speciality may provide opportunities for reducing the public healthcare bill. The increasing incidence of mental health problems among the elderly is a looming problem that could have a significant impact both in terms of demand for medical services as well as in a wider social context. There are very significant policy implications and the matter deserves further consideration. Increasing incidence of obesity and the limited success of current attempts to address the problem demand a new impetus and a broader approach. Alternative measures could include additional regulation of the food industry and regulatory constraints on marketing by the fast food industry. New pharmaceuticals and treatments have contributed to a spiralling healthcare bill, and in many countries, future sustainability is a challenge. The time may be ripe for radically rethinking health research strategy with an increased focus on preventive solutions. Widespread personalised medicine is believed to have a significant impact on the future treatment of individuals. Its increasing significance is considered a plausible prospect for the future as pharmacogenetic knowledge grows and costs continue to fall. Pharmacogenomics also provides a mechanism for improvements in the pharmaceutical regulatory regime leading to a broader range and lower cost of drugs. Kopelman, P. (2010). “Foresight Report: the obesity challenge ahead.” Proceedings of the Nutrition Society 69(1): 80‐85. Mossialos, E., Dixon, A., Figueras, J. and Kutzin, J. (Eds.) (2002). “Funding Healthcare: Option for Europe.” Open University Press, Buckingham. Saritas, O. and Keenan, M. (2004). “Broken promises and/ or techno dreams? The future of health and social services in Europe.” foresight, vol. 6, issue 5, 281-291.